Business casual dress for men and women is important in today’s time as every aspect of business demand professionalism and commitment and to show that men and women need to business casual dress. Business casuals are different from your daily clothing and they speak more for you than any other style of dress up because your first impression is always your way of dressing. The way of dressing also improves your confidence level. When we talk about business casual the most important question which arises is that what does business casual dress mean? Business casual mean the style of clothing that is less formal than actual traditionally used business attire but it still gives a businesslike and professional impression especially when you are starting your carrier. Business casual improves their looks when they are going for meeting, interviews, seminars and presentations. Then there is another important question when to dress business casual? When to Dress Business Casual? Generally, when certain company or organization wants business casual they demand from their employees but mostly business casual dress are used for the company interview, seminars, campus placement or during presentation. Sometime companies demand business casual on daily basis but it greatly depends on the industry you are working with like Bankers. In case of doubt ask first about the dress code then decide what to wear. Avoid personal choices and conform beforehand. There is separate guideline for men and women when it comes to business casual but few things are common for both parties. When choosing business casual keep in mind that it should be neat, crisp and look appropriate for chance meeting with boss, MD or CEO. Business casual must be fit, comfortable and according to your body type; avoid tight or baggy clothes at any cost. Business casual dress is classy rather than trendy or party attire. There are few basic thing everyone must know for business casual; pants or khaki, neatly pressed, long sleeves pressed with collar, solid shirt are safe for both women and men. Showing more than needed is not appropriate for women in business casual, same thing applies for men also. Choose right winter wear in case of chilly weather or cotton dress neatly pressed and wrinkle free for hot climate. It is safe to dress according to company policies but choose according to business environment for good judgment. The most basic accessories for both men and women are shoes and belt. Use leather shoes and belt, avoid using any fancy item or substitute for these accessories as shoes and belt both can enhance or degrade your overall look. Do not overdo anything. Right accessories compliment your dress. Always choose fine quality cloth because your clothes are your first impression. You do not need to spend more than necessary as you are not the owner of the company but choose fine quality clothing which look good and appropriate for business environment at least for few initial year of your job. Fine quality of clothing improves your good looks and first impression as a professional. Also use your commonsense for dressing as choose right color according to your skin tone and business environment, appropriate shoes are also important. If you dress inappropriate for an event you have less knowledge about, then apologies and make a decent impression by intelligent question and interpersonal skills. After some common points we need to focus on specific guideline for men. There are things necessary for a business casual dress. These things are necessary to keep in mind for business casual. Shirts are the important part of any dressing style but when you are dressing for business casual then white or light color solid shirt are your safest bet even conservative stripes can do. Full sleeves shirt are always better than half sleeves one even in summers. Full sleeves button down shirt gives you more sophisticated and professional look. Ties are for more formal attires. They are not necessary for business casual but you can always wear a tie as it is better to be overdress. Tie adds a more formal look to your attire but if you don’t need one at your event or meeting then you can always remove it but do it discreetly and put it in your bag or somewhere other than your pockets because dangling tie from your pocket is not a good impression. Use clean washed shocks and preferably wear mid-calf shocks as they hide skin near ankles when you sit down. Always wear formal leather shoes avoid using sandals, boots or sport shoes. Shoes can improve your overall look and compliment your dress well but wrong choice in shoes can make your overall appearance unprofessional. Jewelry can easily add bad-attitude look to your appearance so choose conservative jewelry like a conservative watch, avoid using ear ring or other piercing or hide them nicely. Check your surrounding and observe other males to check whether it is appropriate to wear them. In conservative industry jewelry for men are very limited. Wearing facial hair is your choice but keep them clean and well groomed. You must know your industry and check beforehand if it is okay to wear them. Observe other males in your industry to conform. Conservative industries prefer more on professional look than casual. There are few things one should keep in mind while dressing for business casual. When it comes to women they need to be little more careful while dressing for business casual. Don’t confuse your attires with each other; you can’t wear your business attire to the club or your club attires to your offices, so choose well. Pants and skirt both are acceptable in case of women, they can wear both but they should not be tight. Dark solid colors are more professional like so choose color like navy blue, brown, grey, khaki etc. fabric of pants and skirt should be crisp; pant should be creased and tailored, skirt should not be tight or flowing. Observe other women in your industry and learn from experienced employees how to dress according to the demand of the industry. Skirts are used in various lengths for business casual; a skirt must touch your knee in standing position and cover your thighs while sitting. Slits in skirts are acceptable if their purpose is to make skirt wearing more comfortable but slit to show your skin is unprofessional like and unacceptable. Slit in your skirt never be too high or length never be too up not above your knees. Shirt and blouse of women should be tailored according to their fit and size; extreme loose or tight is unacceptable. Shirt or blouse should be ironed and cleaned and well kept. Use cotton and silk type of fabric. Sparkly or glittering fabrics are not suitable for business casual. Color combination between skirt and blouse also match. Always keep that in mind that cleavage is not necessary and acceptable. Accessories and jewelry use to improve your look but excessive use of them can be a disaster for a business casual so keep them simple and conservative like a watch. If you are working in fashion industry or in creative industry then you have more flexibility to dress up. Accessories trends come and go so keep your choices neutral and conservative. Avoid heavy accessories or jewelry. When it comes to shoes wear something comfortable and classy with coordinate to your dress. Use leather or micro fabric in shoes and avoid uncomfortable, high heel, sparkly and sporty shoes. Navy, black, brown etc are the acceptable color while white and pastel are unacceptable. Always keep that in mind walking comfortable with proper coordinate between dress and shoes is must. Your dress up is your first judgment and you won’t like to walk in pinching shoes. Keeps your makeup light and natural looking; too much makeup can ruin your look while bare face is unprofessional. Makeup according to time is also important. Your nails should be clean and polished. Avoid too much color and length and use light shade to paint your nails. Use a bag or purse according to your need. You can keep a briefcase if needed otherwise carry a simple purse. Should be coordinated with your dress and do not carry an oversize or too small purse. Use something more professional like leather, woven and microfiber and avoid soft fluffy bag. Briefcases are not needed for business casual but you can carry one in case you need something to carry in that. 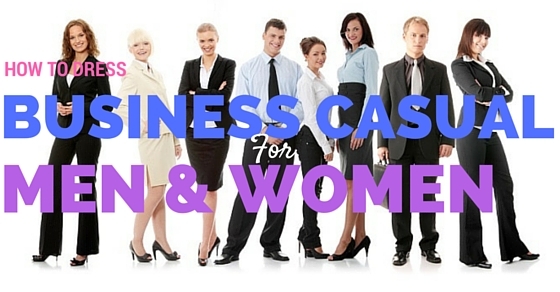 These are the specific details for men and women while dress up for business casual. Keep it simple, conservative and more professional like. Use colors which are suitable for business with right accessories. There are some grooming tips for both men and women. There are few small details left even if we discuss all about how to dress business casual. They are some of the important tips we needed even if we are not dressing business casual. These grooming tips can be used by anybody and everybody. Easily used in your daily life even if you are a professional or not. Use natural fragrance, long lasting and light smell to avoid body odor. Avoid using too much and visible talcum. Polished and well kept. Avoid worn out heels and dirty looks. Keep them in good shape and use right fit and comfortable shoes. Clothes should fit you perfectly. Tight or baggy both are unacceptable. Use ironed clothes. Avoid dirty or wrinkle cloth. Worn out dresses are unacceptable. Proper fit is necessary. Check tags and threads in new cloth. No missing button, worn out stitching, no lint and no stains. Keep these fine details in check before leaving your house. Use appropriate carry bag if needed. Do not carry briefcase, heavy bags, purses if not needed. If going for an interview or meeting then keep all the documents and files in proper folder and bag. Consider industry and then choose what kind of bag you need to carry. Business casual men and women dress usually used for interviews, seminars, meetings and presentation. Conservative industries prefer business casual while other industries demand clothing as per their need. Business casual is less formal and easy to carry on the regular basis if you know how to dress business casual for men and women. Little mistake in your attire can affect your overall look and make you look less professional. Your looks are your first impression so dress appropriately. Right dress for right occasion is the first step you need to start your carrier. Business casual for men and women have same rule and regulation with little changes. So, it is better to ask beforehand if specific organization need certain type of dressing because business casual is casual, it never considers special cases if you are working in their company.